I've been a big supporter of Pixar ever since I first saw Luxo Jr. way back in 1988, when John Lasseter and I were doing the festival circuit. I remember one drunken night at the Ottawa Animation Festival when John Lasseter, the late Joe Ranft, and I, after a long night of reveling and drinking, decided to break the law and relieve our bladders into the Ottawa Canal. Now that Pixar is by far the leader in animated features, I'm always first in line to see their newest. 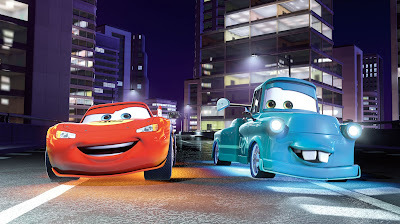 I was doing my four city book tour and it was a rainy afternoon in Oregon and I decided to take my niece (age 11) and nephew (age 9) to see Cars II. We had all liked the original Cars so we were excited to see number 2, despite the mixed reviews. Also, I was to do a master class at Pixar the next week, so I felt it my duty to watch the film. I regret to inform that the film was not up to typical Pixar standards, especially the story. It meandered, it brought in too many characters and locations that soon disappeared. And where was the powerful emotional impact of all the earlier Pixar films? I thought the look of the film was pedestrian and bland. I also had trouble with the eyes of the vehicles – they seemed a bit too simple to really draw me into the personalities – and the eyelids were clearly sun visors. I would have forgiven these detractions if there was a lot of humor, but the laughs just weren't there. Yet, my younger companions liked the film a lot, though they kept asking me where is the “Hudson”. The film will of course make a lot of money, especially the merchandise will bring a bonanza to Pixar. My thoughts are that Mr. Lasseter is so busy running Walt Disney and Pixar Studios, he really doesn't have time to concentrate on the individual feature films like he was able to before he became the head of Disney. The marketing guys probably forced him to make Cars 2 because of the huge merchandise payday in the franchise. Of course it's silly to feel sorry for John, as he's probably the richest artist in the world, but I'd rather spend my time drawing my shorts and features than spend it dealing with a massive corporation and all the meetings and bureaucracy that is involved. I give Cars 2 a C.
Forgive my ignorance of your career Bill, but do you have a team that works with you on your shorts or are they entirely of your own creation? I totally understand your desire to keep away from that corporate world as much as possible. I actually find it amazing that anything really powerful ever comes out of the Hollywood machine. Yet somehow gems do get through. Perhaps that's a measure of their strength as films? Who knows!